In the old Azure portal, you could simply stop a "Classic" Linux VM without doing waagent -deprovision+user, and then create a snapshot from it. That snapshot could then be succesfully used to create new VM instances. But, as I found out the hard way, this does not work with Azure Linux VMs through the new portal / new style VMs. So I ended up with a VM image that can only created un-bootable VMs, AND the template VM itself could not be started anymore because it was generalized. The well-known error "Failed to start virtual machine 'templateVM1'. 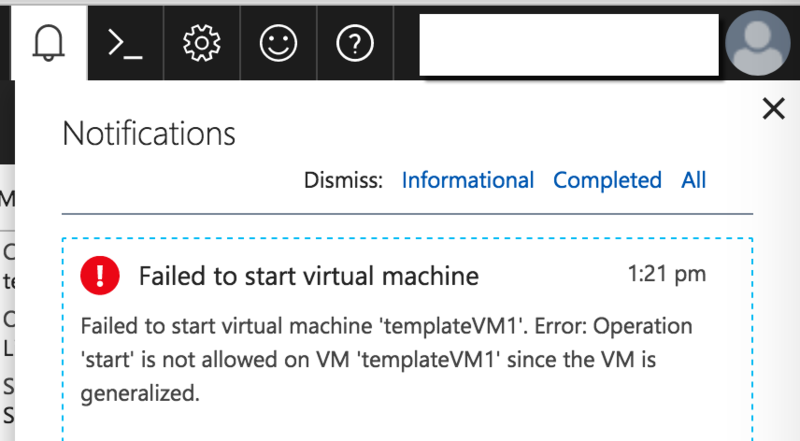 Error: Operation 'start' is not allowed on VM 'templateVM1' since the VM is generalized." occurs when I try to start the VM. Luckily, I found a simple way to bypass the "since the VM is generalized" message. A while back, I needed to set up a new Ubuntu server for Lucee web hosting. Luckily, I came across a great install script, which not only installed Tomcat and Lucee, but also set up nginx and mod_cfml. Having developed the 1.1 version of mod_cfml, I noticed not all options for mod_cfml were yet available in the scripts. So I added path_info support, and now also added support for the X-webserver-context header. The X-webserver-context header makes sure Tomcat / mod_cfml only creates one Host for each server-block/VirtualHost/web-context. Without this header, if you have multiple hostnames pointing to the same web context (eg server_name *.mysite.com;), Tomcat would create a new Host for each new hostname, which can take up quite some resources. These additions have now been added into the github repository, and have become the basis for the new mod_cfml installation steps for nginx. Mod_cfml now supports Apache httpd, IIS, and nginx, on all operating systems. I think we have come a long way now. If you're still missing something, let us know at modcfml.org. While setting up a new Ubuntu server, I decided to install Nginx instead of Apache httpd, having been jealous at the easy config files nginx has. I was really happy to find out Pete Freitag already created install scripts for Nginx + Lucee + Tomcat + some other goodies. One of the first problems I encountered after install, while moving existing sites to this new server, was the absence of cgi.PATH_INFO. Especially on this blog, it is used on each page, except for the homepage. It took me a few hours of Googling and trying, and almost gave up, since all examples on how to enable it included the use of fastcgi. Which is not what I am using: I am proxying to Tomcat. Main problem I encountered was the fact that the PATH_INFO header was just not proxied to (or picked up at?) the Tomcat backend, even while adding "proxy_set_header PATH_INFO /bla/bla" to the config. Then, it suddenly hit me. For the modcfml project, contributor Bilal Soylu added support for PATH_INFO to his AJP connector for IIS, called the BonCode connector. AJP does not natively support sending the path_info header to the AJP backend. What Bilal did in the BonCode connector, is adding a request header xajp-path-info, which contains the actual path_info on the IIS side. He also made sure the 3 opensource CFML engines Lucee, Railo, and BlueDragon, accept this incoming header as the fallback path_info source. For example, see Lucee's cgi.path_info implementation at Github. The header is supported in Railo since May 2012, according to the JIRA ticket. So that's cool: we can use a different header to send to Tomcat, which will still be picked up as regular path_info by Lucee/Railo/BlueDragon! After a reload of Nginx, your path_info should be working! If it isn't, let me know. Mod_cfml is software which shares webserver configuration with Tomcat, eliminating the need to configure hosts (or websites) in Tomcat. I am very proud to say that I had a major role in the current new release. I rewrote the Apache httpd component in native C, added new features, fixed bugs, and generally improved speed by a factor 5 to 10. That's at the moment when it's actually used by the way; on the first hit of a website after the server started up. Speed: creating a new host context now takes 1 second at most (5 – 10 times faster then before), because jar scanning is now disabled by default. Speed: “waiting for context files”, the slow part of previous mod_cfml, is gone. Speed and memory footprint: only one Tomcat Host container is created per Apache/IIS virtualhost. All aliases / default site hosts / IP-based hosts, are now added as aliases. Which takes about 200 milliseconds. The Apache 2.4 connector is rewritten in C. No more need to install Perl, just compile or drop in the mod_cfml.so file, and add a few lines of config! Full support for path_info. Previously, URLs like /some/page.cfm/id/123 would not work in Tomcat. With mod_cfml 1.1, now they do! Thanks to a great idea which was already implemented in the BonCode connector. Security: a shared secret key implementation is added, to prevent unauthorized context creation. Virtual directories, or “Aliases” in Apache, are now by default sent from Apache to Lucee, for the current request. The updated Documentation and Installation instructions can be found at www.modcfml.org. So… what are you waiting for? Install! Upgrade! And have fun with CFML!